The direction of the position is expressed in words "Buy" for long positions and "Sell" for short positions. In the "Price" field you can see the open price of the position and the current price of the instrument (for closing the position). Next, you can see the levels of Stop Loss, Take Profie and Trailing Stop for the position. 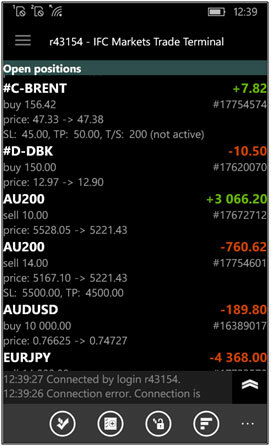 In the right-hand column you can see the deal number and the current trade result - Profit/Loss in the account balance currency. Moreover, positions with a profit are green, while those with a loss are red. 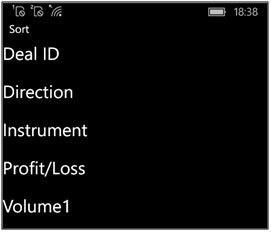 Moreover, it can be performed by five features: Deal ID, Direction, Instrument, Profit/Loss and Volume. Additionally, the list of open positions can be displayed by the aggregation of all open positions by the "Sum open positions" function from the start menu.